One of our wonderful advisors, Natalie Abdou, used to work with the Coady Institute. She does a lot of rad theatre and creative facilitation work, this is just one of in her toolkit. We are made up of our thoughts, actions, intuitions and dreams. To work well with others, we want to be aware of all of these dimensions. 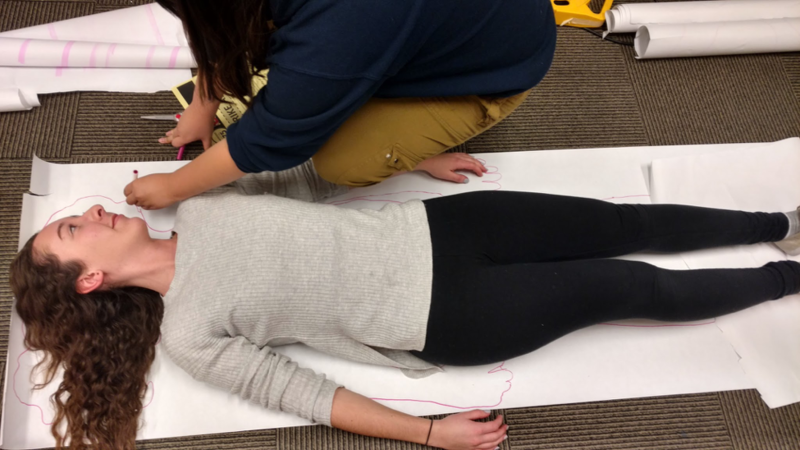 Ask participants to pair up and give them chalk or pen to sketch the outline of each other’s bodies. Head: What’s in your head? What thoughts go through your mind on a regular basis? Heart – what is in your heart? what passions do you have? Hands – What do you do with your hands? Feet – Where do your feet take you? Where are you going? * intuition is sometimes hard to pin down. We’ve often understood it as your instincts. Things that maybe some deep part inside of you craves, before your mind gets in the way. In their pairs, have them share their body story to one another. They should take time to explain each part. It allows participants to think about the different pieces that define who they are. It’s also a great way to have people get to know one another in more depth. If you want to do this exercise with chalk on the ground, you should see first if this is something the group would be ok with. You could also tell people to show up with clothes they are ok getting dirty in – that way they’ll feel more comfortable and prepared. It’s hard to answer deep questions with just a few words or symbols. If you want to capture more depth in the answers then it would be best to do it on paper. Chalk becomes hard to work with if the surface is too rough. We’ve also adapted this technique for The Bathroom Research project we ran in collaboration with student groups at the University of Toronto. There the technique was adapted to capture how people relate to their gender and sexuality in bathrooms. Allow people to make different shapes with their bodies if they’d like. It’s interesting to understand why they made those shapes and how that relates to what they put in their body story. A quick look at the time we did it with student and grassroots youth leaders in Medellin, hosted at EAFIT University.